From The Covenanter, vol. 5. The footnote appears in the original. Paisley — Its Antiquities, Manufactories, Martyrs, Theological Seminary, Social and Religious Condition. Paisley, which I visited on the 28th of September — having left Kilmarnock the day before — was once a flourishing place, and notwithstanding its adversities, still holds an important place among the manufacturing towns of Britain. It occupies the site of an old Roman camp — a ridge some two or three hundred feet high, some half-mile in length, and half as much in breadth, lying nearly north and south, steep on its western side and northern end, less so on the east, where, and on the south, with the plains at their foot, lies the body of the town, and tapering off towards the south until it is lost in the beautiful valley, extending far to the south-west: the western side still retaining its precipitate outline. From the summit of the hill — a vacant green, once the actual site of the Roman encampment — the vision ranges over a wide and varied scene, in every direction, except on the east, where it is soon arrested by spurs shot out by the great central plateau. On the west and south lie the rich plains of Renfrew and Ayr; in the far distance are seen the bare and lofty peaks of the high mountain summits of Arran, often capped with clouds: on the north and north-east, the mountains of Bute and Argyle, with the Gowrie hills. In all, eleven counties are represented in this panorama, which the venerable Professor, whose dwelling is but a few steps distant, takes great delight in exhibiting to the inquiring stranger. 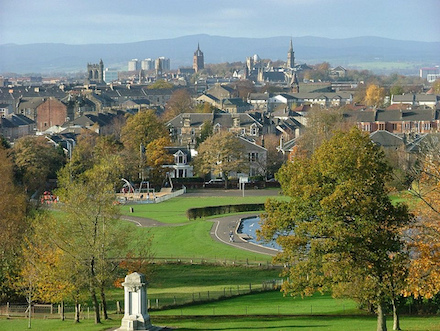 Panorama of Paisley, as seen from Barshaw Park. (cc) image from the city’s community website. Paisley is not without its objects of interest. I have already mentioned, in a previous letter, the Wallace oak and mansion, two miles distant on the south, in the quiet vale of Ellerslie. There is no doubt of their identity. The tree is, however, in the last stages of decay. The dwelling still remains — a substantial stone edifice, some forty feet in length, two stories high, with projecting wings of equal length: evidently built in times when every man’s house was literally his castle. Part of it is still inhabited. In the town itself, near the banks of the Cart, is an ancient abbey, erected, probably, in the 14th century, but most of it still in excellent preservation — indeed, a portion of it, the southern extremity of the old, double church, is still used as a place of worship; the northern portion being the only part of the abbey building that has gone entirely into ruins, enough only remaining to show its original extent and form. The other portions of the abbey, consist of ranges of high buildings, enclosing a square, these in the olden time having been occupied as the residence of the monks and their retainers — on some occasions, furnishing a temporary place of sojourn to the Kings of Scotland. In the Sounding Aisle, so called from its prolonged and rolling echoes, is a tomb, said to be of Margory Bruce, the ancestor of the fated house of Stuart. And, in the church itself, as in many of the ancient chapels and all the cathedrals, are any number of tombs and tablets, and slabs, marking the last resting-place of the great, in their day. What a mockery do most of the inscriptions appear. 1. A name — some title — and, then, “here they lie!” The oldest of these that I noticed was 1433. 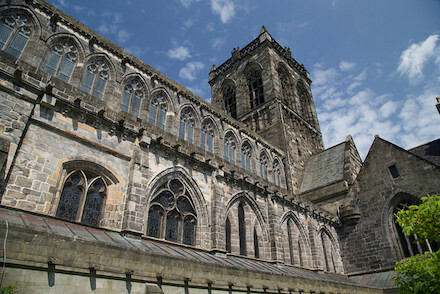 Paisley Abbey. (cc) image from @ArchHist. Here lie the corpses of James Algie and John Park, who suffered at the cross of Paisley, for refusing the oath of Abjuration. On the north side of the pedestal is an inscription stating the time and circumstances of the removal of the remains from the Gallowgreen. JOHN STORIE, JOHN PATISON, and JOHN COCHRANE. By the contributions of Christians of different denominations in and about Paisley, to renew and perpetuate a memorial of the respect and gratitude with which posterity still cherish the memory of the Martyrs of Scotland. To soar and to anticipate the skies. And chas’d them up to heaven. During the recent movements in the extension of church accommodation an elegant structure was erected, in the immediate vicinity of the tomb, having a burying-ground attached to it, and appropriately designated Martyr’s Church. The graves of the two martyrs, though adjacent, were not within the boundaries of the church-yard, and the obelisk stood outside of the wall. The plan, however, of enclosing extensive grounds in the neighbourhood for a new and spacious cemetery was formed, and the ground where the obelisk stood came in course to be included, and the remains, formerly buried in ignominy, now lie in one of the finest burying-places in the country; the erection now marking the spot forming one of its most interesting objects. * Paisley is not now in a flourishing state. There has been a gradual decline, I was told, for twenty-five years past.